I'm sorry to not have posted on Monday. I have been pretty busy trying to get ready for my big trip coming up. There are lots of decisions to be made and I am historically not a good decision maker. When I was a kid, deciding what to eat off of a restaurant menu was excruciating, even deciding what to drink- milk or water??? took some serious thought. Thankfully over the years I have gotten much better, I would say I am pretty close to being a "normal" person in this category now. It's just with Hawaii and the wedding its a lot. What is making getting ready for the trip even harder is that Jeremy and I plan to hike the 11 mile Kalalau trail and camp at Kalalau Beach then hike the 11 miles back the next day. I am not really a backpacker and this is apparently a pretty serious hike. Many outdoor magazines rate it as one of the top 10 "must do" hikes in the world and it is also listed in the top 10 most dangerous trails in the US. Apparently this is one of the sketchiest parts. The trail is steep, muddy, rocky and narrow. 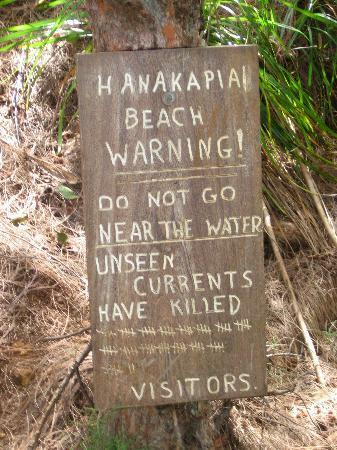 It often rains several times a day in Kauai which is the only time you will get wet because the beaches, which are only accessible by boat or the trail, are very dangerous. Super rocky, who needs a stair master when you've got this trail? But the views are supposed to be absolutely breath taking with beautiful views of the ocean and several waterfalls. 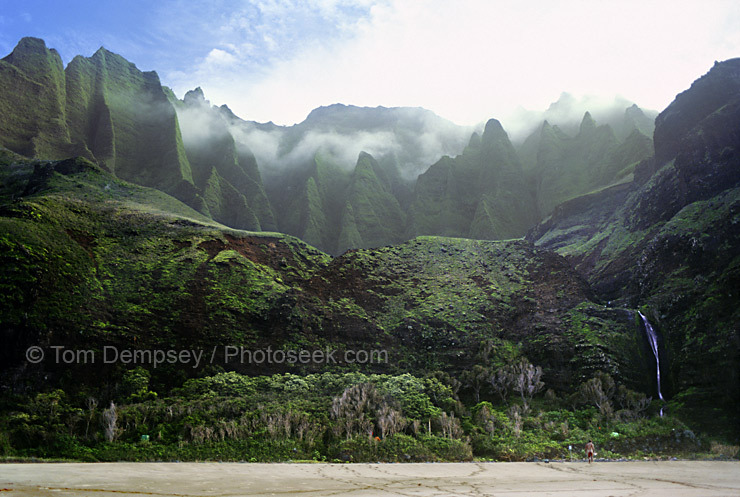 This pic above is looking down on Ke'e Beach, the trail head. When we were in Ke'e Beach two years ago we saw a sea lion that swam with the family, then napped on the beach. There are also lots of chickens and roosters running around wild and men in inappropriate bathing suits. I debated whether or not to show you this pic and I just couldn't help myself. Anyway, this is where my mind is lately (not on men in white see through speedos but on the trip) along with trying to figure out what to say at the wedding when I have to give my maid of honor toast and finishing up the wedding rings which I am taking to be cast today! wahoo! If you have any tips to help me with any of this please feel free to share! Oh and if you'd like to read more about this hike here are some links. All of the pics above (except for the last two and the one at the bottom of the page) came from trip advisor. Thanks for your patience, I am trying to get back on track!